While based on one of their chassis, this is no hum-drum Plymouth Valiant. This car, dubbed “Asimmetrica” for its asymmetrical design, was one of the last projects kicked off between Chrysler and Ghia during Virgil Exner‘s design reign at Chrysler. Or, at least that’s the thought. Some people say this was a Ghia thing all around. Built as kind of a successor to the Plymouth XNR Concept, this was supposed to be a “more realistic” car that could actually be built in limited numbers and sold to the general public. Yes, this was the restrained version. The plan was to build a run of 25 of these, but it’s thought that only two were ever made. Power comes from a NASCAR-spec 2.8-liter Hyper-Pak slant-six making 101 horsepower. Displayed at the 1961 Turin Motor Show and, later, the Geneva Show, this example was purchased off the Geneva stand by novelist Georges Simenon. Acquired and restored by the Blackhawk Collection in 1989, the current owner purchased the car in 2000. A wild example of unrestrained early 60s design, it should bring decent money in Monterey. Click here for more info and here for more from this sale. 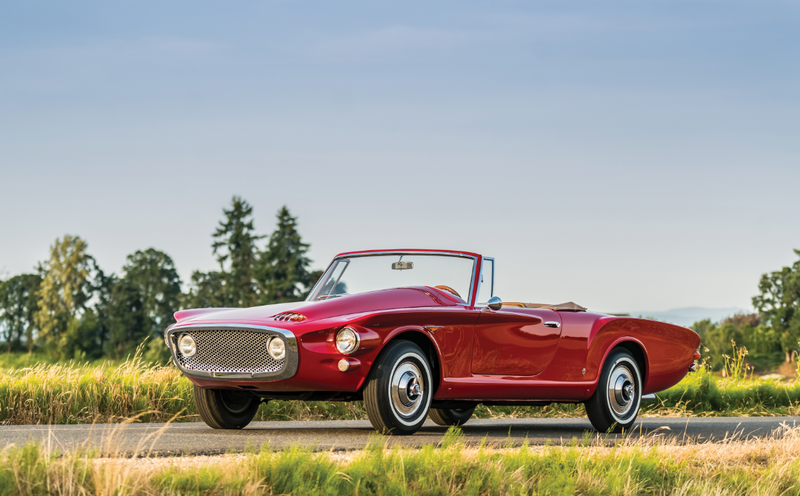 This entry was posted in Uncategorized and tagged 1961, asimmetrica, auctions, cars, classic cars, ghia, plymouth, rm sothebys, roadster by classiccarweekly. Bookmark the permalink.